Networked, dual-tuner for North American broadcast and cable TV. See [[Silicondust_HDHomeRun]] for other models available. 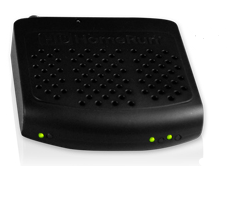 The HDHomeRun, by Silicondust USA (a wholly owned subsidiary of Silicondust Engineering, New Zealand), is an external HDTV tuner for personal computers. It actually has two independent tuners, and interfaces to the computer via ethernet. The device is supported by MythTV (since v[[Release_Notes_-_0.20|0.20]]), as well as many other PVR software packages. * HDHomeRun [http://www.silicondust.com/hdhomerun/hdhomerun_development.pdf Development Guide]. *Watch live TV on DLNA-compatible devices, including smart TVs, game consoles, and media players. *Watch TV from any computer on your network. * MythTV - DVR for Linux, Windows, OSX. Requires Myth v0.20.0 or later. These instructions are adapted from HDHomeRun user support forum. Broadcasters in North America transmit very limited guide information along with their digital TV transmissions. It is recommended to create an account with SchedulesDirect, instead. SchedulesDirect provides guide information at least 2 weeks in advance that is far more extensive and accurate than that available free with broadcast TV. The price is $25/year with first 7 days free. If you are using the MythTV 0.20 Ubuntu/Debian package then you will need to update /usr/lib/libmythtv-0.20.so.0.20.0 once mythtv has been installed. On the SchedulesDirect website, sign up for an account and create a channel lineup: either Local Broadcast or for your cable provider. Follow the instructions if you receive broadcast programming via an antenna. Compare the list of channels that Myth has found with the channels listed by SchedulesDirect for your location. In SchedulesDirect, disable any channels that you aren't able to receive. Print the "Report" available from SchedulesDirect's web site--we'll need the enter the XMLTVID values. For each channel, clear the checkmark on "Use on air guide" and enter the XMLTV ID value from SchedulesDirect. Note: you may find [[Scte65scan]] to be an alternative option that may more easily align channel numbers. Print the "Report" available from SchedulesDirect's web site--we'll need the enter the XMLTVID values. For each channel, clear the checkmark on "Use on air guide" and enter a channel number and the XMLTV ID value from SchedulesDirect. Make this option the default for all mythfilldatabase runs initiated by mythbackend. In mythtv-setup, go to "General", find the screen "Program Schedule Download Options" and ensure that "Guide data arguments" contains "--dd-grab-all". At this point, you should be able to run mythbackend and schedule recordings. See the Troubleshooting section if you experience difficulties. The older HDHomeRun (with the white case) is capable of forwarding infrared (IR) commands via your LAN to LIRC. This can save you some money on purchasing an additional IR receiver for your frontend. However, the IR receiver is very directional and may require you to aim the remote directly at the HDHR. These instructions come from the Silicondust website. The HDHomeRun normally expects to obtain a DHCP lease. However, with the latest firmware it is also possible to configure it statically. This is particularly convenient if you want to connect the HDHomeRun directly to a NIC on your MythTV system, rather than through a switch on your network. To do this, configure your local interface with a static IP address in the range of 169.254.x.x (eg. 169.254.1.10) with a subnet mask of 255.255.0.0 and no gateway. No need to configure routes, the HDHR's will not be accessible to devices on your existing network, but your backend should have no problem seeing them. Choppy playback, trying increasing the network buffers. Check for network loss found in silicondust FAQ [http://www.silicondust.com/forum/viewtopic.php?t=5877&start=0&postdays=0&postorder=asc&highlight=&sid=5f241e003d343fdb9350d8bb97625a82 forum]. Pasted below, you can translate the path of the binaries yourself. 1) Run HDHomeRun Setup and go into the channel editor. Choose a physical channel number (for example CH102). This is the number before the - in the Tune column. Replace "<channel number>" with the physical channel number from HDHomeRun Setup (e.g. 102). Replace "<channel number>" with the channel number for an unprotected channel in your area. The DVB HDHomeRun3 (second generation with a single antenna input) has been known to have issues getting a lock on some Australian channels when set to 'Auto' constellation. 1) Make sure that the frequency configured in the Transport is correct. SBS Melbourne is 536625000 Hz (536.625 Mhz), not 536500000 (536.5 Mhz) as is configured by default in MythTV. The HDHomeRun appears to be able to correct for this, but it may still cause issues. If you have this incorrect frequency in your transports, delete it then proceed. 2) Do a channel scan scan of the correct frequency, but set the Constellation to QAM-64 and the channel bandwidth to 7Mhz (it may not find the channels if these are set to the default of "Auto"). If, after setting the constellation and bandwidth correctly you do get a lock when scanning for channels, this will create the transport and channels, however it will not configure the constellation correctly to the QAM-64. mythtv-setup also may not reliably allow you to edit the transport parameters through the GUI. Networked, dual-tuner for North American broadcast and cable TV. See Silicondust_HDHomeRun for other models available. 4 Can't Connect to HDHR? MythTV - DVR for Linux, Windows, OSX. On the SchedulesDirect website, edit the your channel lineup and enable/disable channels based on channels listed in the Channel Editor in mythtv-setup. Make sure the channel name and number in Schedules Direct matches the display channel name and number in the Channel Editor in MythTV. Print the "Report" available from SchedulesDirect's web site--we'll need the enter the XMLTVID values. Check for network loss found in silicondust FAQ forum. Pasted below, you can translate the path of the binaries yourself. This page was last modified on 15 November 2014, at 15:03.